Brainstorming - Vurgoyles - Greater Gargoyle? OKAY, so I am really loving the look of the VURGOYLE ... I think I have 8 of them now : P They have three "colors" (rarity) Red/Yellow/Blue. I have 2 Red and 6 Blue, but they all cost around $3 each. I think the coloration makes them ready-made for Uncommon Heroes. Still need some stats ... but will brainstorm below. So I saw both of these figures separately and thought that they might make a nice Unique Hero + Common Hero combo. My initial inspiration is that MOKK is a figure upgrade from Marvel Comics "Gargoyle" villain that petrifies people with a touch. I thought about carrying over this power into a 'magical hammer' that turns its target's to stone. Once the victim is turned to stone, then MOKK can 'stone-shape' and 'animate' that petrified victim into a Vurgoyle. Re: Brainstorming - Vurgoyles - Greater Gargoyle? Mokk begins the game with 3 single-space Rock Outcroppings on his Army card. After moving and instead of attacking, you may place 1 single-space Rock Outcropping from this card on any empty land space within 6 clear sight spaces of Mokk. If Mokk destroys a figure, you may immediately replace that figure with a single-space Rock Outcropping, if possible, from this army card. After revealing an order marker on Mokk, before taking a turn with him, you may first take a turn with 2 Vurgoyles you control. This Vurgoyle begin the game on this Army Card and can only enter the battlefield via the Rookery of Stone special power. When a Vurgoyle is destroyed, immediately remove it from the game before using the Special Power(s) on any other Army Card. After revealing an order marker on this card, you may replace a single-spaced Rock Outcropping with 1 Vurgoyle and then immediately take a turn with that Vurgoyle. If you control Mokk, place the Rock Outcropping on Mokk's Army Card. You may use Rookery of Stone up to three times in the turn that you revealed an order marker. When counting spaces for this Vurgoyle's movement, ignore elevations. This Vurgoyle may fly over water without stopping, pass over figures without becoming engaged, and fly over obstacles such as ruins. If this Vurgoyle is engaged when he starts to fly, he will not take any leaving engagement attacks. Okay, now that I have the Vurgoyles 'in hand' they are both: (a) incredibly awesome!!! 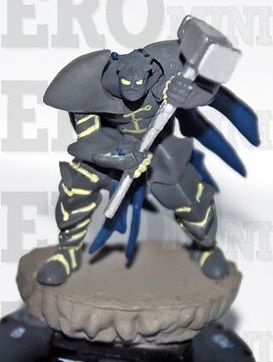 and (b) waaaay to big for Mokk from Heroclix to be their Hero. So! I am going to swap out Mokk and now we have a place for Kronan, the Earth Primordial!! 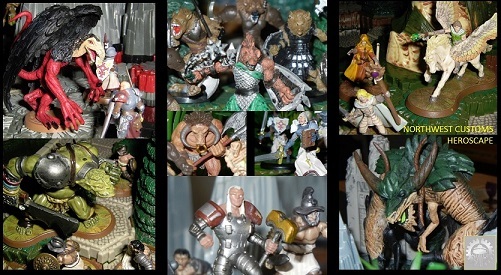 But I am also considering making the Vurgoyles Uncommon Heroes and going back to the drawing board. The sculpt is just that cool!!! I like the Vurgoyles . . . and wasn't too enthralled by the Mokk figure (plus, there is already a Mokk in C3V). Is Kronan going to have the synergy with the Vurgoyles? 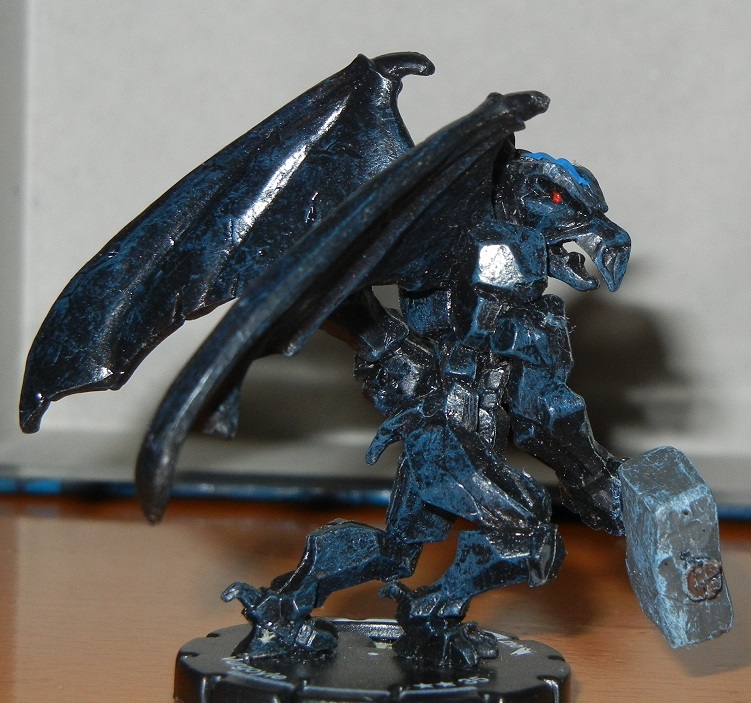 Now that I see how cool the Vurgoyle figure is, I am thinking of going back to the drawing board with the design. I could see them being an Uncommon Hero now (sort of like Ogre Pulverizers) but will need to brainstorm again. I could also see them as some sort of Valhalla hero that has synergy with the Granite Guardians, Torver, and/or Stenvar. OKAY, so I am really loving the look of the VURGOYLE ... I think I have 8 of them now but grabbed extras to share : P They have three "colors" (rarity) Red/Yellow/Blue. I have 2 Red and 6 Blue, but they all cost around $3 each. I think the coloration makes them ready-made for Uncommon Heroes. Before moving, you may choose a figure within 5 clear sight spaces that does not have height advantage on this Vurgoyle. Add 2 to either the Move or Attack Value of this card for this turn. This Vurgoyle must end its movement adjacent to the chosen figure and attack that figure this turn, if possible. 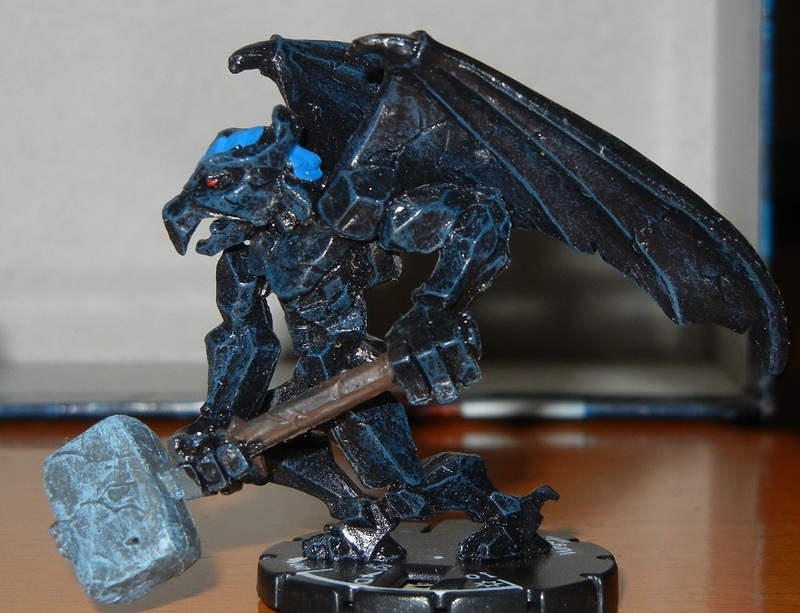 After attacking, if this Vurgoyle did not inflict a wound, roll one combat die. 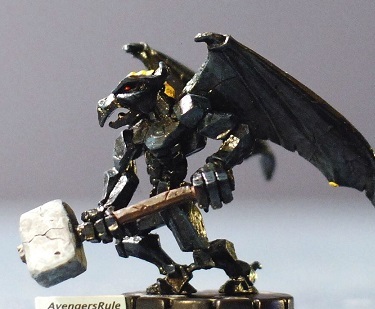 If you roll a skull, this Vurgoyle takes one unblockable wound. Yes - I'm trolling the threads. This figure is really cool. I'm thinking a unique hero or two figure unique squad. They seem too special to be common heroes.